Take a poll of fans of Disney animation, and there's a really strong chance that 1973's Robin Hood will end up getting some of the lowest ratings. There's a good reason for this: Robin Hood is definitely one of the studio’s worst efforts. Everything about this film screams its mediocrity. At no point do we encounter an actual plot. Instead, the movie connects a conglomeration of mildly related sequences. As I discovered during Alice In Wonderland, this kind of film can work, but the material has to be good enough to stand on its own, which is not the case with Hood. I found virtually all of the mini-sequences to seem fairly bland and uninspired. Although the Robin Hood legend features some strong personalities, you wouldn't know that from the generic characters we find here. Our main leads, Robin (Brian Bedford) and Maid Marian (Monica Evans) are completely flat and lifeless; nothing about either of them stands out in any way, and I could not have cared less about their ultimate fates. However, fairly dull protagonists are not unusual for Disney animation. Going all the way back to Snow White, we find more uninteresting leads than we do firecrackers. At least Robin is an active participant in his life, unlike some of the passive personalities we've seen in the past. He's still dull, though, and as is often the case, the usual roster of wacky sidekicks comes along for the ride to make the film livelier. Few of these characters work. As Little John, we find Phil Harris in his third straight Disney animated release. 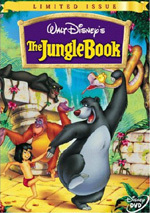 As Baloo in The Jungle Book, he played a bear version of himself. For The Aristocats, he branched out a little and went for a cat who actually was our leading man. O'Malley retained much of Baloo's swagger and looseness, however, so the differences were greatly exceeded by the similarities. At least O'Malley was a minor stretch, which isn't the case for Little John. Here we again find Harris in big, fat bear form, and the character comes across as an insanely blatant reprise of Baloo. The part isn't as good, however, and Little John adds no spark to the proceeding. Almost none of the remaining supporting cast makes an impact either. In fact, the only interesting character was Prince John. Peter Ustinov does a nice job with the role, and although it's quite one-dimensional – Prince John never appears as anything but a greedy, malicious, sniveling coward - Ustinov at least adds life to the part and makes him much more entertaining than anything else in the movie. Perhaps this was just a transference of my enjoyment of the character, but Prince John also seems better drawn than the other roles. This doesn't mean PJ displays terrific animation. It's more of an indictment of the relatively weak quality of the rest of the film. Hood clearly displays some of the sloppiest Disney art on record. As I'll note later, I actually had trouble judging the quality of the DVD transfer because so much of the animation looked so careless. Stray lines flit about the screen, and the general presentation appears crude. It even looks as though some of the animation simply duplicates efforts from other films. The scene in which Maid Marian dances in the forest seems suspiciously similar to a portion of Snow White. Speaking of Maid Marian, does anyone else fail to understand how she – a fox - can be related to Prince John - a lion? Yeah, I know it's a fantasy, but some internal consistency would be nice. Actually, this connects to the most daring aspect of Robin Hood: it was the first Disney film to feature no human characters. Granted, Bambi came close since we never saw the men, but their affect on the story was immense. (Hey, it's not like Bambi's mother committed suicide.) Obviously, a lot of other Disney offerings focussed on animals, but humans remained part of the mix. Another "all-critter" flick wouldn't appear until 1994's The Lion King. But that ends the similarities between Hood and the 1994 hit. Robin Hood is such a cheap, lifeless affair that even the credit sequences appear frightfully generic. At the start, we get a quick and tacky introduction to the participants; we see an animated image of the character with his/her name and species beneath it. For example, we might see "Robin Hood - A Fox". The typeface used for these introductions is so bland that you'll initially think you've activated the subtitle function. Every expense was spared for Robin Hood. I didn't hate this film, as my affection for Disney animation remains strong enough that even their worst efforts still give me some pleasure. However, I found it difficult to resist fast-forwarding through this movie, and that ain't good. 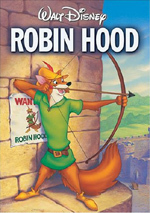 Robin Hood appears in an aspect ratio of 1.33:1 on this single-sided, double-layered DVD; due to those dimensions, the image has not been enhanced for 16X9 televisions. Is this the film's original theatrical aspect ratio? You got me. Many of the Disney animated movies have appeared in fullscreen presentations, and once you get past 1953's Peter Pan, it appears completely unclear if these pictures were originally framed as 1.33:1 or if they were in another aspect ratio. If the latter case was true, are the DVDs unmatted - which means no information disappears from the side, as only the top and bottom of the frame would be blocked to make the dimensions more rectangular - or are the images true pan and scan affairs? A variety of opinions abound on this issue, and no one seems to know for certain. IMDB indicate that the film's aspect ratio was 1.75:1. That may well be correct, but at this point, I don't think I'm going to find a definitive answer. All I do know is that I noted no signs of cropping on the sides of the frames at any point during the movie, so this edition does not seem to represent a "pan and scan" transfer. The original theatrical release may have used slight matting to achieve 1.75:1. I witnessed a little evidence of too much space at the top or bottom of the frame, but for the most part, 1.33:1 looked pretty well-composed. The image itself suffered through a mix of ups and downs. On the negative side, it featured more flaws than I expect from Disney animation. So much of their stuff appears nearly pristine that I'm always surprised when flaws show up, which they definitely do during Robin Hood. The film often displayed mild grain and some light white speckling. Black marks also appeared at times, as did streaks, hairs, spots and scratches. None of the flaws ever became intense or overwhelming, but they could be distracting. I admit that I judge Disney animation on a stricter standard of cleanliness than I do other films; they've kept so many of these movies in such good shape that they've raised the bar for cleanliness. 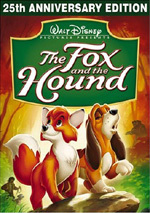 Clearly Disney spent more effort in regard to this area with their older, "classic" films, because it tends to be somewhat more modern efforts like this or The Fox and the Hound that look less than terrific. Definition was acceptable, though the presence of some prominent edge enhancement made the image hyper-sharp at times. This gave the movie a harsh digital look that made it tough to watch. I couldn’t find any real softness, but the edginess led to more jaggies and shimmering than expected, and the picture simply looked wrong. Colors seemed pretty well-saturated and accurate, though the poor quality of the art also affected these. Hues could appear a bit blotchy due to the inconsistent animation, but they usually were fine. Black levels seemed equally adequate, and shadow detail was appropriately dense. This wasn’t an atrocious image, but the mix of issues meant it deserved no better than a “C-“. The film's monaural soundtrack maintained a more even level of quality, but unfortunately it's not very strong. The audio seemed listenable but fairly bland. Dialogue sounded clear and intelligible but lacked warmth. Effects were suitably realistic and they display no distortion but they also seemed flat and lifeless. The songs and the score came across as acceptably smooth and clean but suffered from the same thin and dull quality that affected the rest of the mix. This soundtrack seemed reasonably acceptable for its era but I can't say anything more positive about it than that. Robin Hood includes few supplemental features, but these beat a kick in the head. Best of the bunch is a 1933 Mickey Mouse short called "Ye Olden Days". This eight-minute and 10-second cartoon is completely unrelated to the legend of Robin Hood, but it appears because the medieval theme connects the two to a degree. In any case, it's a fun little piece. It's not phenomenal - almost no Disney shorts without Donald Duck achieve greatness, in my opinion - but it's entertaining and cute. Historical footnote: "Ye Olden Days" marks Goofy's final appearance under his original name. With his next cartoon - "Orphan's Benefit" in 1934 - he went Hollywood and changed from "Dippy Dawg", which is how he was known through his first six pictures. And the rest was movie history! A few other elements round out the package. We find a Read-Along Storybook that reiterates the plot for the kiddies as they follow the text. The narrator does a pretty nice job of emulating the various voices, all of whom he performs alone. It's still a lame story, but his performance makes it a little more fun. There's also a Sing-Along for the annoying tune "Oo-de-lally". This piece overlays the song on top of relevant film clips and displays the lyrics at the bottom of the screen; a bouncing "Mickey head" points out the words to be sung. Because "Oo-de-lally" is a fairly short tune, the verse is actually repeated to make it longer. This makes the song seem twice as terrible. Finally, the DVD ends with a 16-question trivia game. The questions remain quite easy for anyone who has actually seen the film. Finally, a few ads open the disc. We get clips for “The Walt Disney Gold Classic Collection”, The Little Mermaid II: Return to the Sea, The Tigger Movie, and Toy Story 2. These also appear in the Preview Trailers area. As a Disney die-hard, I will keep Robin Hood in my collection. However, only folks like me will want to own this mediocre and bland film. The story is a mess, while the animation, characters, songs, and pretty much everything else remain passable at best and become bland and flat at worst. The DVD provides subpar picture and sound, along with some minor supplemental features. Robin Hood isn't terrible, but it's pretty much the worst Disney have to offer. Unless you're like me and you just have to own each and every movie, this is a DVD to skip.